The Grand Prix has inspired a growing number of developers to create video games that simulate this sport. 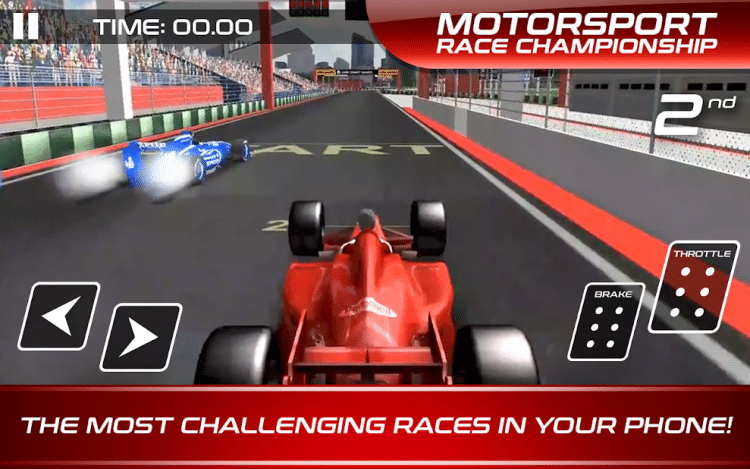 The team at Carling Dev has joined the Formula One bandwagon with their Moto Sport Race Championship game. You don’t have to make any big decisions on manpower, race strategy or car development. This title is purely about racing. Pick your car of choice to dominate the asphalt tracks. Whether you choose to play Moto Sport Race Championship on PC or mobile, it will test your reflex as you navigate intricate race tracks. There are only two modes to play. When new to the game, start with the training mode. It is the best way to learn the basic gameplay mechanics. Train on different tracks such as the International, Green Hills, Little Town, and World Cup circuits. Once you are ready to compete, play Championship mode to race against AI drivers. Races involve only four cars, with every driver vying for the top spot. You must complete three laps around the track to finish the race. The faster you finish and the higher your rank at the end of the run, the more coins you earn. You can expect the modern open cockpit single-seater Formula One cars in this game. In the initial stages of playing Moto Sport Race Championship on PC, you only get access to only one car. You need coins to buy and unlock the other motorbikes. There are only four models available, namely Volcano, Thunder, Rocket, and Bullet. Driving these speeding machines is easy thanks to simple controls. To accelerate, simply press and hold the throttle button. The brake control also reverses and you also get two left and right turn buttons. It would have been great to have a track map or shape but the game’s HUD offers enough details to help you track your performance. You can check the screen when racing to see your current position, lap number, and elapsed time. Crashing into a wall will slow you down, allowing other drivers to catch up or extend their lead. On the other hand, an accident involving another driver leads to a disqualification, forcing you to start over. Therefore, avoid collisions when driving at all costs. Turns can be tricky to get around. The key to smooth driving around bends is to lightly tap the turning controls. If you press the left or right turn too hard, your car will go off track and possibly crash into the track wall. Watching a video allows you to get free money. Use this trick to increase your coins and quickly get the amount of cash you need to unlock a specific racing car. Unfortunately, this game does not notify you when driving in the wrong direction. The easiest way to know is by watching the signboards on the track wall. You will know you are deriving in the right direction if your car’s movement approaches the words on the signboards from the first letter to the last one. Even if you are dead last, don’t quit midway. Make sure to finish the race. You still get a small coin reward for participating.